You’d like to change some of your calendar settings, add a sub-calendar, or create a calendar link. These can all be done in Settings (by the calendar administrator) in the browser version. You’d like to save an event to the default calendar application on your device, e.g. iCal on an iPhone. 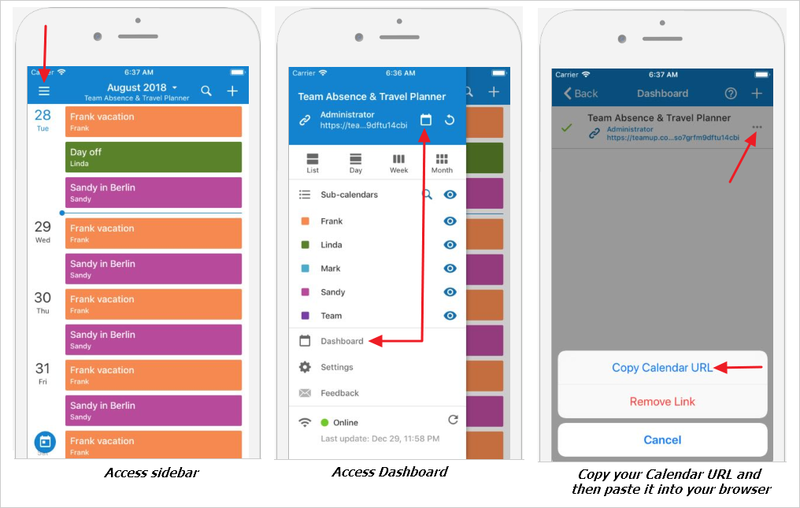 Note: this article discusses accessing Teamup on a mobile browser when using an iOS device. For instructions for using Teamup on a mobile browser with Android devices, see this article. Use a calendar link that has been sent to you and is accessible on your device. This could be a link in an email or a text messaging app on your device. Click on that calendar URL and open it using your mobile browser. From your iOS app, access the sidebar and go to the Dashboard. Click the 3 dots next to the calendar link and select Copy Calendar URL. You can then paste the calendar link into your mobile browser’s address bar. Type the calendar URL directly into the address bar of your mobile browser (which could be Chrome, Firefox, Safari, Microsoft Edge or another mobile browser). 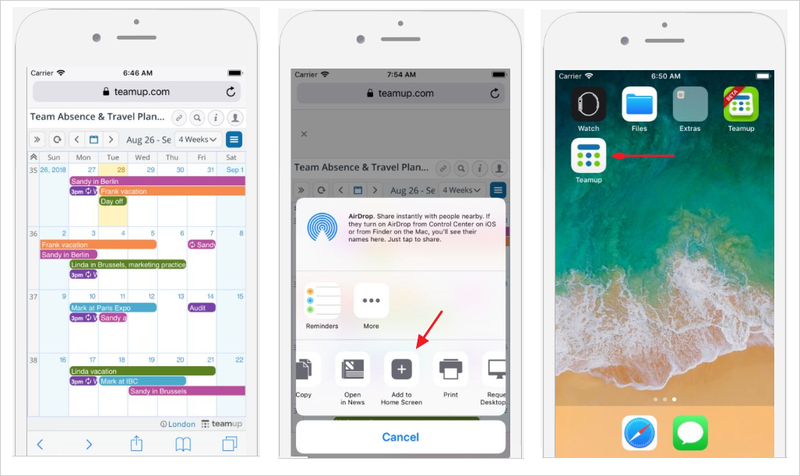 Once you open a calendar link in your mobile browser, you can add it to the home screen of your iOS device for quick access in the future. Tap the Share button , then select Add to Home Screen. 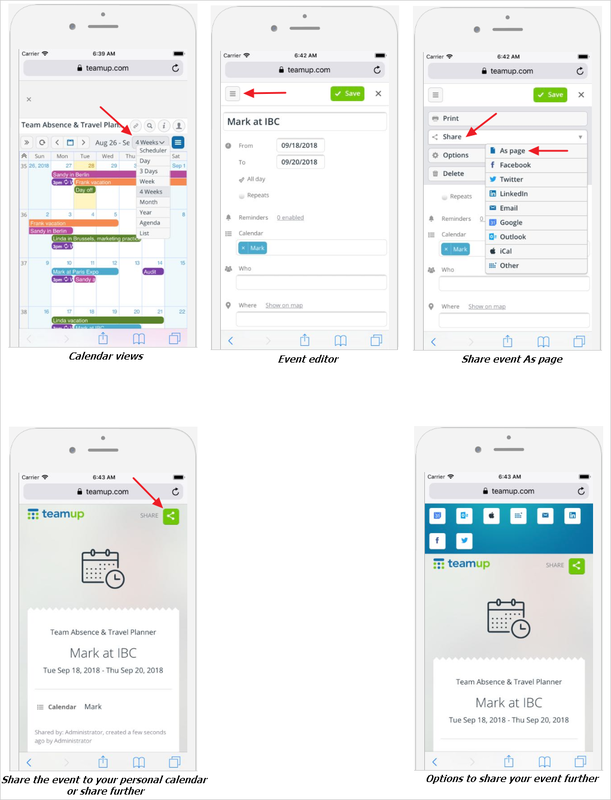 After creating the shortcut, tap the Teamup icon (see the graphic below) to access your calendar. You can add multiple calendar links to the home screen, resulting in multiple Teamup icons. You can give the icons different names to differentiate between calendar links. Your Teamup calendar icons can be placed side by side on your home screen or organized in a Teamup folder, if you prefer.